You may, in accordance with the TOS, view content provided through the Service and, to the extent permitted by Soft-BabeZ, download content or portions of content provided by the Service, to a single personal computer or other storage device. You may not otherwise copy, distribute, or perform the content of the Service, or create derivative works using that content. You understand and agree that the Service is provided to you on an AS IS and AS AVAILABLE basis. Soft-BabeZ disclaims all responsibility and liability for the availability, timeliness, security or reliability of the Service or any feature or software included in the Service. Soft-BabeZr disclaims all responsibility or liability for the acts or omissions of third parties whose services, software, content, or advertising may be utilized in connection with or provided by the Service, and you agree that Soft-BabeZ will not be liable for any such services, software, content, or advertising. Soft-BabeZ reserves the right at any time to modify or discontinue, temporarily or permanently, the Service (or any part thereof) with or without notice. The Service may be subject to interruptions, caused by Soft-BabeZ or others. You agree that Soft-BabeZ will not be liable for any modification, suspension, interruption or discontinuance of the Service. You will not reproduce, duplicate, copy, sell, trade, resell or exploit, for any commercial purpose, any content (other than content you have uploaded using the Service) or any component of the Service, or any use of or any access to the Service, without the prior written permission of Soft-BabeZ. The Soft-BabeZ Service and all of its components are intended only for adults who may legally access and use them. The Service provides access to sexually explicit material. In addition, the Service may provide you with the ability to communicate with other users of the Service, to interact with performers online, and to upload, store, and share content. 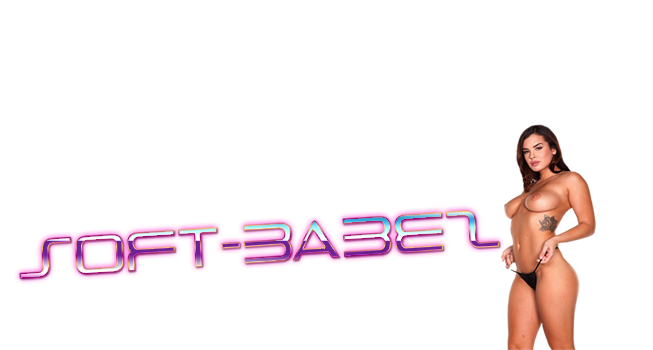 The Service provides you with the ability to upload User Content either through the Soft-BabeZ website, or through the Soft-BabeZ Community. User Content uploaded through the Soft-BabeZ website will generally be made public. When you upload User Content through the Soft-BabeZ Community, you may choose to keep the content private (meaning only you or another person with the ability to use the account you create will have access to the content), to share it with specific other members of the Soft-BabeZ Community, or to make it public. You consent to the public dissemination of all User Content you submit through the Soft-BabeZ website, that you upload through the Soft-BabeZ Community and designate as public, or that you communicate using any other feature of the Service that does not expressly provide for limited access to User Content. You understand that once made public User Content cannot be made private again. You understand and agree that User Content you communicate using the Service may be recorded, stored, copied and/or retransmitted by Soft-BabeZ, including but not limited to User Content that you upload through the Soft-BabeZ Community and designate as public or to be shared with specified members, audio or video content submitted to the Soft-BabeZ Blog. You agree that you will not use the Service to post, transmit, or share User Content that you did not create or that you do not have permission to use and share through the Service. You affirm that you have all intellectual property rights (including without limitation copyright and trademark rights), licenses, and permissions that are needed to use and to authorize Soft-BabeZ to use User Content you provide in the manner described in these TOS. By submitting, uploading or posting User Content, you warrant that it does not infringe any intellectual property rights of another person. You acknowledge that Soft-BabeZ does not promise that any User Content you submit to it or that you communicate using the Service will be maintained by Soft-BabeZ. You are solely responsible for creating backup copies of and replacing any User Content you submit to Soft-BabeZ or post on the Service, at your own cost and expense. You agree that Soft-BabeZ has no responsibility or liability for the deletion of, or the failure to store or to transmit, any User Content. Soft-BabeZ retains the right to create limits on use and storage at its sole discretion, at any time, with or without notice. All content and components of the Service other than User Content (“Soft-BabeZ Content”), including without limitation, the software, text, photos, video and audio content, graphics, interactive features and advertisements, and all trademarks, service marks and logos used in the Service, are owned by Soft-BabeZ, or are licensed to Soft-BabeZ subject to copyrights or other intellectual property rights held by others. Soft-BabeZ reserves all rights to the Soft-BabeZ Content, User Content, and any other component or content of the Service not expressly granted to you by these TOS. Soft-BabeZ provides the Service for the personal, non-commercial use of viewers, visitors, subscribers or potential subscribers of the Service. You are granted a personal, non-exclusive, nontransferable license to view, on a single computer only, the content of the Service. Soft-BabeZ reserves the right to limit the amount of materials viewed. Commercial use of any content of the Service, other than your own commercial use of User Content you have uploaded, is strictly prohibited. In addition, except with respect to User Content that you have uploaded, you may not: (i) modify any of the materials provided by the Service; (ii) copy, reproduce, publically display or perform, distribute, or prepare derivative works from any of the content of the Service; (iii) remove, modify or alter any copyright, trademark, or other attribution or proprietary notice from any of the materials used in the Service; or (iv) otherwise transfer any material provided through the Service to any other person or entity. Soft-BabeZ reserves the right to terminate this license at any time if you breach or violate any provision of these TOS, in which case you will be obligated to immediately destroy any materials you have obtained from this Site. By submitting, posting, or communicating User Content using the Service, you grant to Soft-BabeZ an irrevocable, perpetual, non-exclusive, transferable, fully paid, royalty-free, worldwide license to: (1) use, copy, publicly perform, publicly display, reformat, translate, excerpt (in whole or in part) and distribute the User Content in or through any medium now known or hereafter invented, for any purpose; (2) to prepare derivative works using the User Content, or to incorporate it into other works, for any purpose; and (3) to grant and authorize sublicenses of any or all of the foregoing rights. Soft-BabeZ does not assert any ownership over your User Content; rather, as between Soft-BabeZ and you, subject to the rights granted to us in these TOS, you retain full ownership of all of your User Content and any intellectual property rights or other proprietary rights associated with your User Content. Soft-BabeZ may obtain and exercise intellectual property rights over compilations, collective works, or derivative works that incorporate User Content you have provided. In that case, the rights Soft-BabeZ obtains will apply only to the compilation, collective work, or derivative work; as between Soft-BabeZ and you, subject to the rights granted to us in these TOS, you will retain full ownership of and rights to your User Content. When you submit or communicate any User Content using the Service, you also authorize Soft-BabeZ to record and make such copies thereof as it deems necessary in order to facilitate the posting, maintenance, and storage of the User Content as part of the Service. By its very nature, the Service may include offensive, harmful, inaccurate or otherwise offensive or objectionable material. In some cases, the Service may include content that has been mislabeled or is otherwise deceptive. Please use caution and common sense and exercise proper judgment when using the Service. Soft-BabeZ does not endorse, support, represent or guarantee the truthfulness, accuracy, or reliability of any content provided by the Service. You acknowledge that any use of or reliance on material provided by the Service will be at your own risk. Soft-BabeZ may review any content provided by the Service, including any User Content uploaded using the Service, and reserves the right to refuse to distribute any such content or to remove any content from the Service, in it sole discretion. However, you acknowledge and agree that Soft-BabeZ is not obligated to remove any content from the Service, unless and until it is established pursuant to the requirements of the law that the content is illegal. If you believe any content provided by the Service is illegal or violates these TOS, you may inform Soft-BabeZ by using our e-amil contact: yourdailyadult@gmail.com. Soft-BabeZ will review your message and the content to which you object (assuming it is still available through the Service). Soft-BabeZ may remove the content if, in Soft-BabeZ’s judgment, it is illegal or otherwise inappropriate. However, please understand that deciding whether content is inappropriate is a judgment call, and that Soft-BabeZ is not legally responsible for content that it does not originate. Neither is Soft-BabeZ legally responsible for removing content that it deems inappropriate from the Service. Soft-BabeZ reserves the right to access, read, preserve, and disclose any information as it reasonably believes is necessary to do any of the following: (1) satisfy any applicable law, regulation, legal process or legitimate governmental request; (2) enforce these TOS, including investigation of potential violations hereof; (3) detect, prevent, or otherwise address fraud, security or technical issues; (4) respond to user support requests; or (5) protect the rights, property or safety of Soft-BabeZ, its users and the public. You agree that Soft-BabeZ will not be liable for exercising or failing to exercise any of these rights. Soft-BabeZ respects the intellectual property rights of others. We prohibit users from uploading, posting or otherwise transmitting materials that violate the intellectual property rights of others. When we receive notification of alleged copyright infringement that complies with the Digital Millenium Copyright Act (17 U.S.C. § 512, the “DMCA”), we promptly remove or disable access to the allegedly infringing material. We also terminate the accounts of repeat infringers. Soft-BabeZ, Soft-BabeZ.com, and other Soft-BabeZ logos and product or service names are trademarks of Soft-BabeZ. All other trademarks used in the Service are trademarks of their respective owners and our reference to them does not imply or indicate any approval or endorsement by their owners unless such approval or endorsement is expressly made. The Service may provide links to sponsor, advertiser, or other third party websites that are not owned or controlled by Soft-BabeZ. Inclusion of, linking to, or permitting the use or installation of any third party site, applications, software, content or advertising does not imply approval or endorsement thereof by Soft-BabeZ. Soft-BabeZ has no control over, and assumes no responsibility for, the content, privacy policies, or practices of any third parties. By accessing or using the Service, you agree to release Soft-BabeZ from any and all liability arising from your use of any third-party website, content, service, or software accessed through the Service. Your communications or dealings with, or participation in promotions of, sponsors, advertisers, or other third parties found through the Service, are solely between you and such third parties. You agree that Soft-BabeZ shall not be responsible or liable for any loss or damage of any sort incurred as the result of any dealings with such sponsors, third parties or advertisers, or as the result of their presence in the Service. YOU EXPRESSLY UNDERSTAND AND AGREE THAT YOUR USE OF THE SERVICE IS AT YOUR SOLE RISK. THE SERVICE IS PROVIDED ON AN “AS IS” AND “AS AVAILABLE” BASIS. Soft-BabeZ EXPRESSLY DISCLAIMS ALL WARRANTIES OF ANY KIND, WHETHER EXPRESS OR IMPLIED, INCLUDING, BUT NOT LIMITED TO THE IMPLIED WARRANTIES OF MERCHANTABILITY, FITNESS FOR A PARTICULAR PURPOSE AND NON-INFRINGEMENT. IN PARTICULAR, AND WITHOUT LIMITATION, Soft-BabeZ MAKES NO WARRANTY THAT: (1) THE SERVICE WILL MEET YOUR REQUIREMENTS; (2) THE SERVICE WILL BE UNINTERRUPTED, TIMELY, SECURE, OR ERROR-FREE; (3) THE RESULTS THAT MAY BE OBTAINED FROM THE USE OF THE SERVICE WILL BE ACCURATE OR RELIABLE; (4) THE QUALITY OF ANY PRODUCTS, SERVICES, INFORMATION, OR OTHER MATERIAL PURCHASED OR OBTAINED BY YOU THROUGH THE SERVICE WILL MEET YOUR EXPECTATIONS; (5) ANY ERRORS IN THE COMPONENTS OR CONTENTS OF THE SERVICE WILL BE CORRECTED; OR (6) OR THAT THE SERVICE IS FREE OF VIRUSES OR OTHER HARMFUL COMPONENTS. No advice or information, oral or written, obtained by you from Soft-BabeZ, shall create any warranty not expressly stated in these TOS.